The New Living Catalogue is available now. It's filled with stylish ideas for your home and garden, plus great gift ideas and all the latest gadgets. 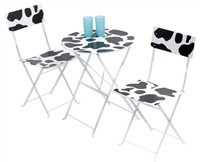 Get your garden ready for Summer with this fantastic Cow Print Bistro Set. With over 1000 items at half price or less there really isn't a better time to shop! Don't delay, visit 24studio.co.uk and check out the latest deal of the day.